Anne Imhof’s Performance piece constructed below glass floors floating above the German pavilion with caged dogs Wins the 57th Venice Biennale, Golden Lions. 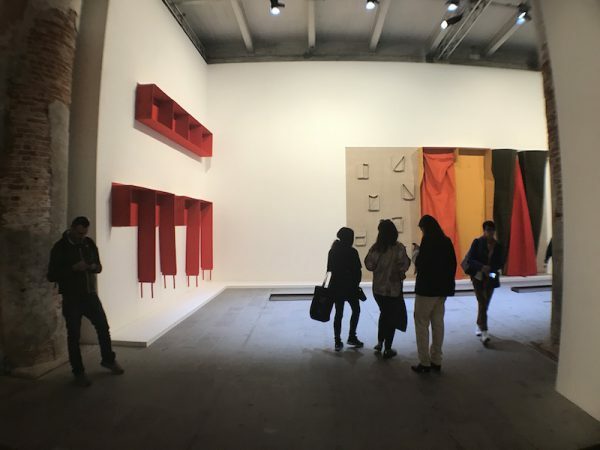 The artist was presented the award along with another German Franz Erhard Walther who also won gold for his large 1980s fabric installation in the Arsenale. The exhibition was part of “Viva Arte Viva”. Egyptian Arand Hassan Khan won silver. 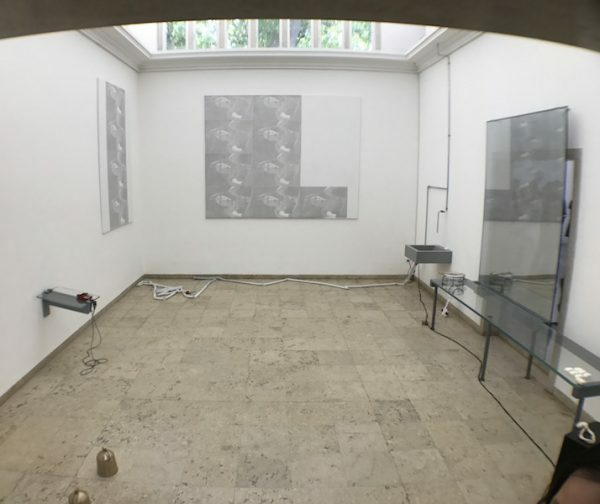 Titled Faust the German Pavilion work was commissioned to represent the country at the 57th International Art Exhibition – La Biennale di Venezia. 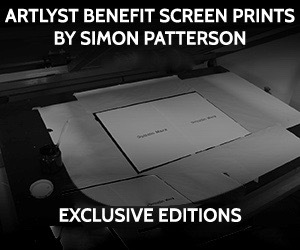 The work has proven to be popular with long queues snaking for around one hour to enter. Anne Imhof’s fearless “Faust” mixes performance, sculpture and installation. The work was cited by the jury as “a powerful and disturbing installation that poses urgent questions of our time and pushes the spectator into an aware state of anxiety.” The piece concerns newsworthy issues such as immigration, black bloc style protesting and exclusion. At one point while I was viewing the pavilion, a group of three black-clad artists scaled the high fence and sat staring at the queue with menacing looks. The dogs barking below. Imhof’s exhibition has touches of Sado-Masochism thrown in for good measure. The 39-year-old artist moves above and below the glass floor, objects have been scattered including an ominous black mattress handcuffs and cutlery. The Dobermans play and pace guarding the fenced in area in front of the pavilion. “My work stands for the grace of thoughts, for liberty, for the right to be different, for gender nonconformity, and the pride of being a woman in this world,” Imhof said at a ceremony in the Venice Giardini, where many of the national pavilions are located. “The piece we developed for the German pavilion makes transparent the past but it speaks to the future,” she said. The pavilion’s curator, Susanne Pfeffer, stated the work “is really about inclusion and exclusion. It is a crucial and existential question for a lot of human beings,” not only migrants but also the working poor struggling to get by. “It is giving a very transparent view of the past,” she said, but also stands “for the future, for the grace of thought, for gender diversity, for the pride of women… to know what to stand up for, and when to raise our fists.” Clad in a black baseball cap and black leather jacket, the 38-year-old artist thanked her performers—“If this work moved you, it is because they have moved you”—as well as her Berlin galleries, Isabella Bortolozzi and Daniel Buchholz. The Golden Lion for the best artist in “Viva Arte Viva,” the international exhibition curated by the Centre Pompidou’s Christine Macel, was awarded to the 77-year-old German artist Franz Erhard Walther for his fabric installation in the Arsenale. The Silver Lion for a promising young artist in the group exhibition went to the Egyptian-born, Cairo-based multidisciplinary artist Hassan Khan for a Public Park, an immersive sound installation located in the garden at the end of the Arsenale. Walther was born in 1939 during the outbreak of World War II. He presented three works from the 1980s “Wall formation” series, one of which can be walked on and two wall pieces that the viewer is invited to manipulate.